A steak (/ˈsteɪk/) is a meat generally sliced across the muscle fibers, potentially including a bone. Exceptions, in which the meat is sliced parallel to the fibers, include the skirt steak cut from the plate, the flank steak cut from the abdominal muscles, and the silverfinger steak cut from the loin and includes three rib bones. In a larger sense, fish steaks, ground meat steaks, pork steak, and many more varieties of steak are known. 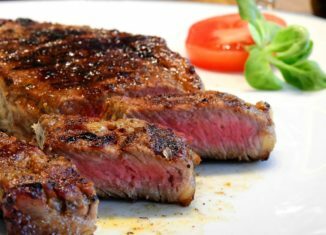 Steak is usually grilled but can be pan-fried. It is often grilled in an attempt to replicate the flavor of steak cooked over the glowing coals of an open fire. Steak can also be cooked in sauce, such as in steak and kidney pie, or minced and formed into patties, such as hamburgers.